Comment: Here is number two from our tri-strike in purple Kashmir Sapphire. 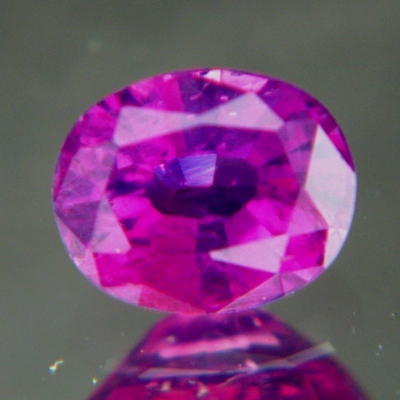 As the image shows, this is the richest purple of the three, really just microns away from ruby. If you want a GIA or GRS certificate this will probably come out as Kashmir purple ruby. Silky sleepy crystal. Nothing one gets to see in Ceylon or African sapphire, definitely unique. No inclusions visible to the eye, good luster, loves light and attention, and will repay with surprising colors, unique glow and elegant fire.